and just thought it looked so beautiful in its simplicity. for the cold winter months just around the corner. and they had a "buy-two-get-one-free" sale. and got this nice white one free! Don't you just LOVE free? that often bring smiles to our faces. on a grey sunless kind of day. OK, now just where exactly did I leave that cuppa.....? How pretty! Thank you for putting the cup of coffee down and grabbing that picture to share! 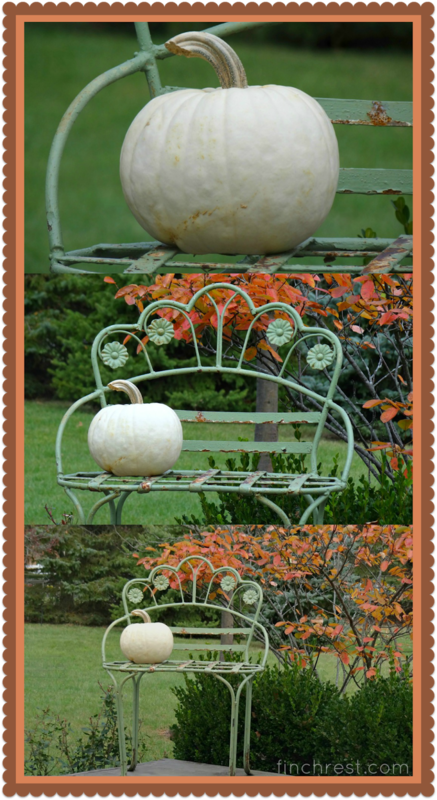 Didn't see a place below to comment--I just wanted to say your bench and pumpkin are elegant. And I agree with Penny--thank you for taking the picture and giving inspiration. Yes...free is GOOD! I love the simplicity in you photos. The green bench is about the same color I painted my vintage glider. We don't have much color here yet...hoping the leaves don't all fall of before they change! Love that garden bench. I didn't buy any pumpkins for the house yet this year. 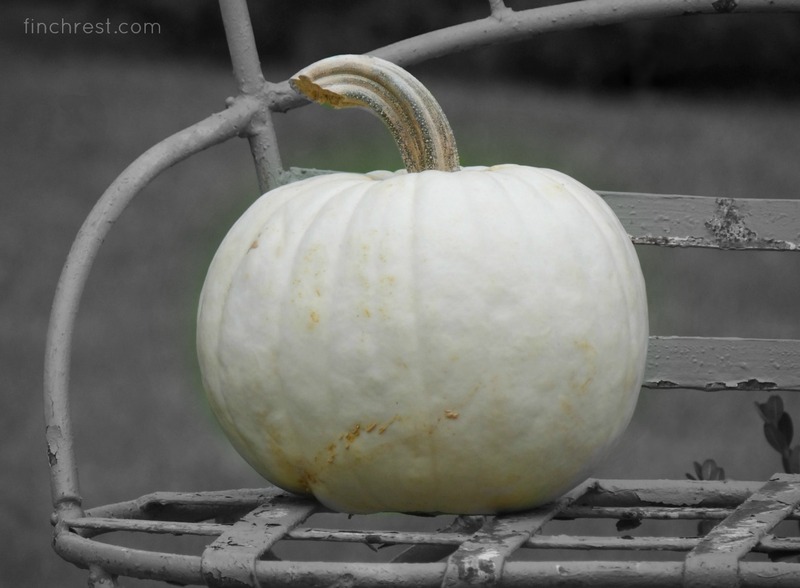 I'm waiting on my son and his girlfriend, who are coming this weekend and then we are all (daughter, son-in-law and grands) going to a pumpkin patch. It will be late for me this year, but I hope to get a couple to add outside to my little patio table and a mini bench I have out there under the Japanese Maple. Pretty vignette. Glad you captured it and shared with us. 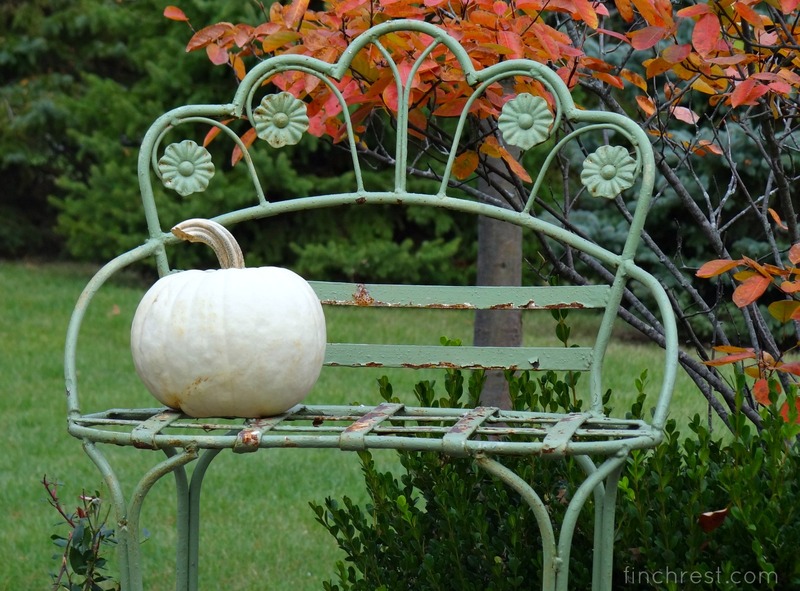 Love your bench and pumpkin. 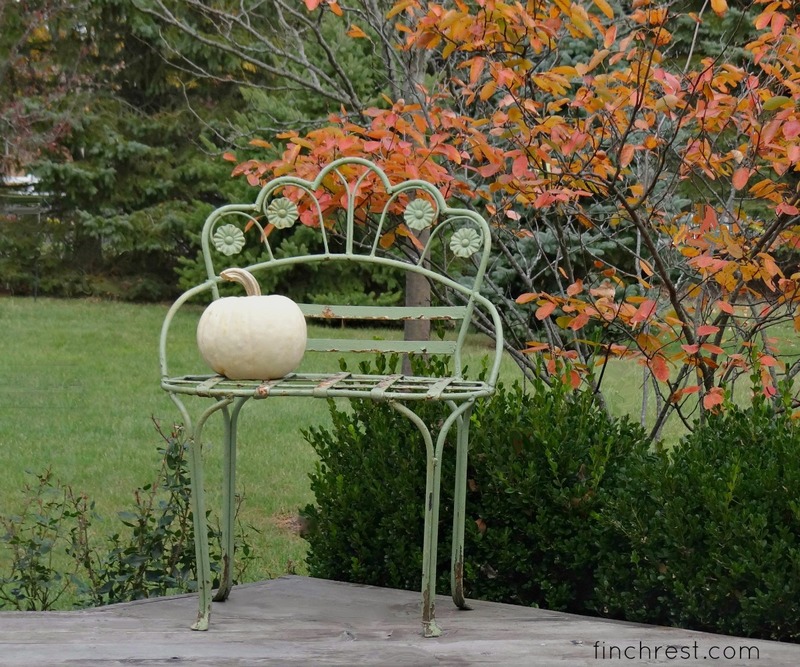 Both have pretty shapes and your fall foliage on your tree is a perfect backdrop. Simplicity is beauty, and these shots are beautiful. Oh it is as if a wee little Miss Autumn Muffet has just left her adorable perch. Thank you for sharing this vision from your yard Michele and I hope you found your cup of tea again. I'm so glad you captured this beautiful setting too Michele! I love it when things catch my eye and I think 'Gosh, that's beautiful' and that is just what you captured...beauty! Have a lovely, lovely weekend. Thanks for capturing the beauty and simplicity of the pretty pumpkin on the garden bench, Michele! Enjoy the pretty, colorful trees while you can, and happy weekend. I love your little green bench. Love it Michele. The bench is so cute and the pumpkin is perfect on it. Simplicity speaks a lot. I hope you found you cuppa!